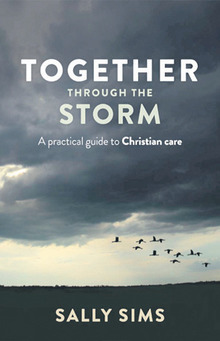 Together Through the Storm will help any Christian to develop in their ability to care for others, but it also provides a useful foundation for training a ‘care team’ in your church. In our fallen world, episodes of sickness, suffering, and other trials are all too common. And the Bible’s clear call for us to show Christian love and care means we know we shouldn’t sit idly by while people around us go though these tough times. Yet our genuine concern for others if often hindered by valid fears – the fear of not knowing what to do or what to say; the fear of putting our foot in it and making things worse; or the fear that involvement may take us beyond our own personal resources. In Together Through the Storm, Sally Sims helps us overcome these fears by setting out clear biblical foundations and very practical guidance for Christian care that is based on the word of God and in Christian hope. Sally brings a tremendously useful mix of life experiences to this important book, including training and practice as a nurse, study in pastoral care and chaplaincy, extensive reading and research, years of coordinating and providing pastoral care in her church, and, of course, personally persevering through her own times of trial.